Last week we had a visit from Bryon Roesselet of Conrad Schmitt Studios. He informed us that the first floor banking hall flooring and wainscoting material that we had been referring to as “white-veined black marble” was, in fact, Vermont Verde Antique Serpentine! Discovered in the early 1900s, the beautiful marble is still be quarried today. 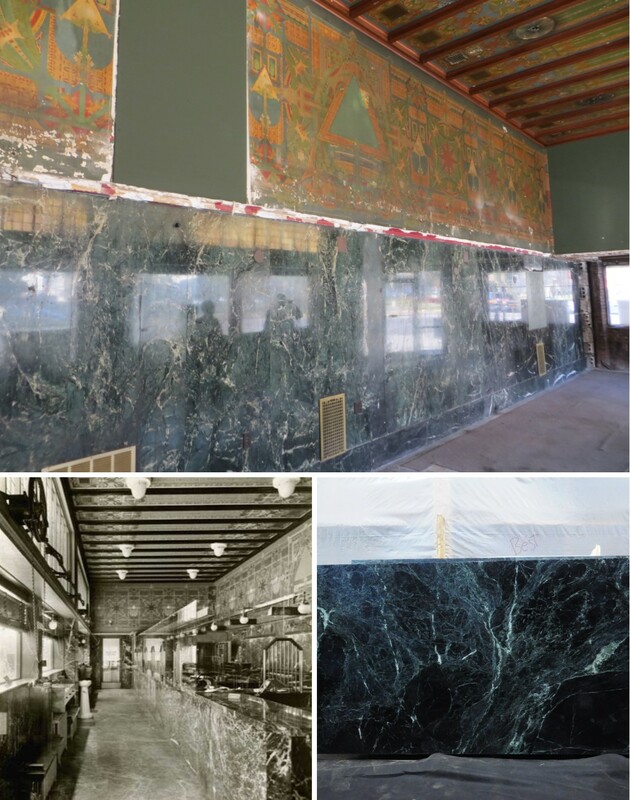 Pictured Above Top: In situ Vermont Verde Antique serpentine in the banking hall; Bottom Left: Historic photo of the original banking floor in 1915. The Vermont Verde Antique serpentine on the north wall, west wall, and some portions of the floor remain today. ; Bottom Right: Photo of a polished slab by block sold by Vermont Verde Antique.